If you've been reading this blog for a while now (and following our Instagram account), you probably have noticed that we're a huge fan of the trees in the neighborhood -- specifically the ones in Dickinson Square Park and the 19oo block of E. Moyamensing Avenue. Phew, these beauties are just due for a trim. You may have also noticed that there have been some mighty menacing looking wood chippers around the neighborhood underneath these sacred trees. Well, fear not! They are only being trimmed. We talked with one of the workers on the ground on the 1900 block of E. Moyamensing and he kind of laughed at the notion that they would be cutting them down. "Nope, we're just trimming them," he said. He also dropped some knowledge on us. "These are London Plane Trees," he mentioned when we asked. We always thought they were straight up American Sycamores -- which isn't that far off. Still unfamiliar with these glorious oxygen producers that have come to define East Moyamensing Ave? 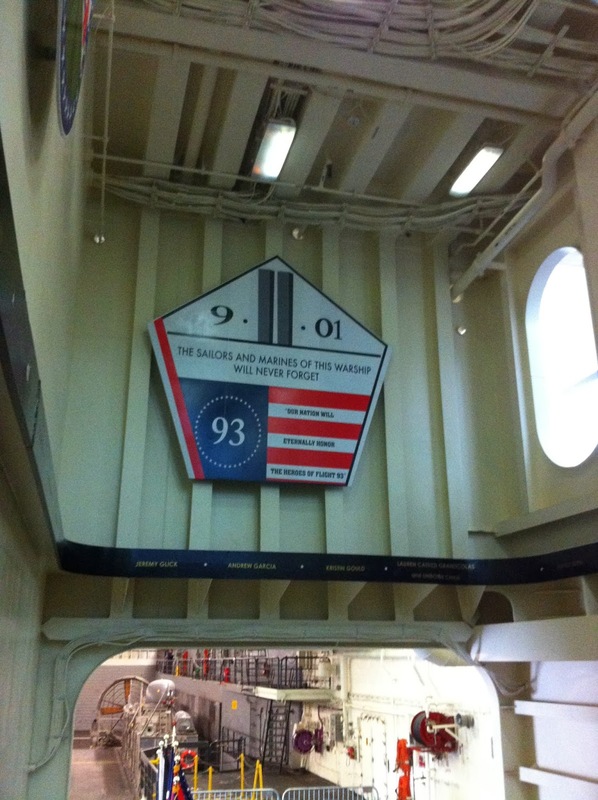 The USS Somerset, a United States Navy warship honoring the passengers and crew of Flight 93, is currently docked at Penn's Landing. 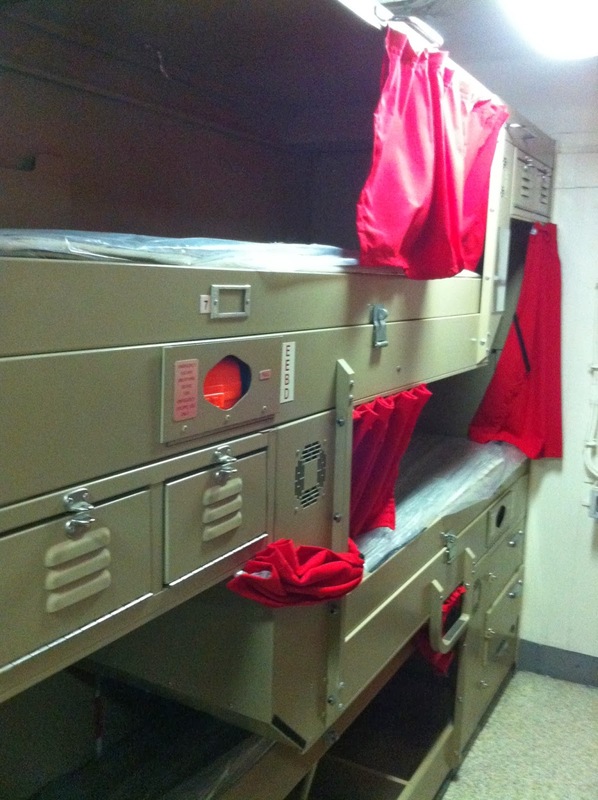 The final public tours of this incredible ship are Wednesday, February 26th from 1pm to 4pm. 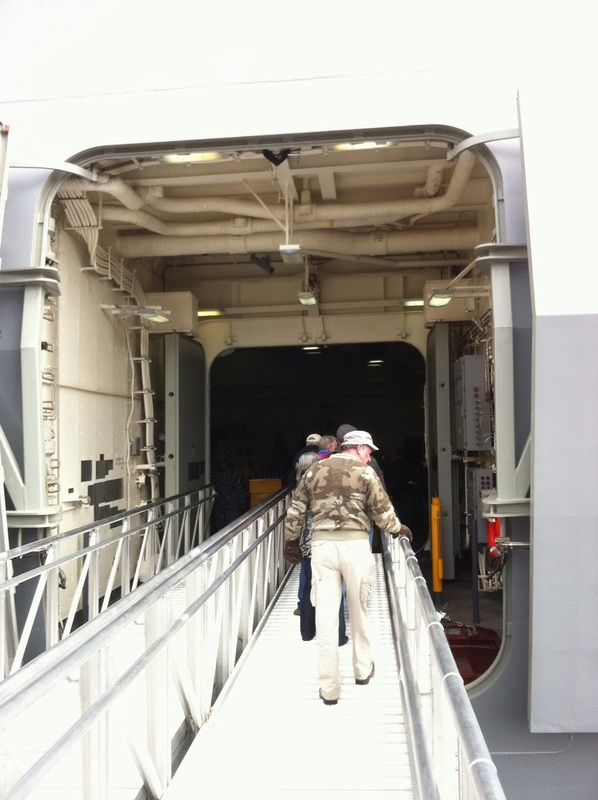 If you can spare the two or so hours for the experience of a tour, I would highly recommend stepping aboard just to see the enormity and meticulous design of this ship. 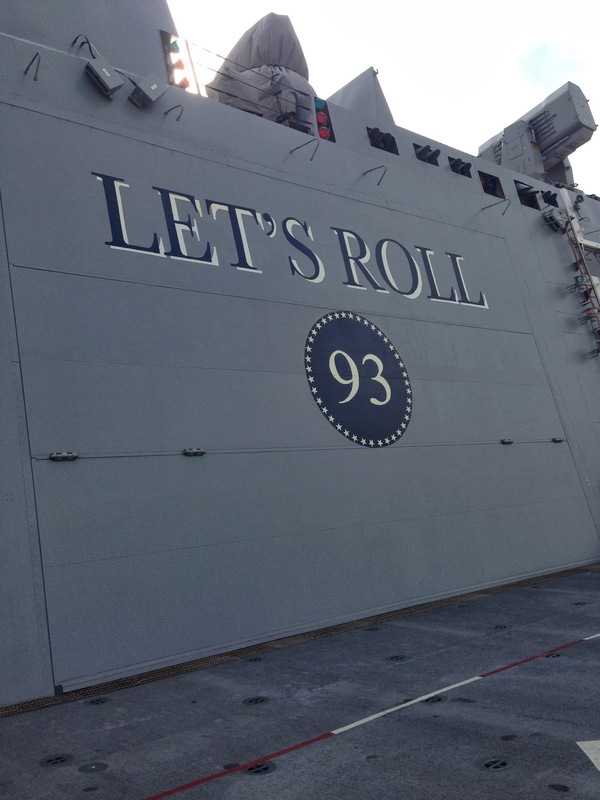 The USS Somerset is set to be commissioned at Penn's Landing on March 1st starting at 11am with public tours following the ceremony. 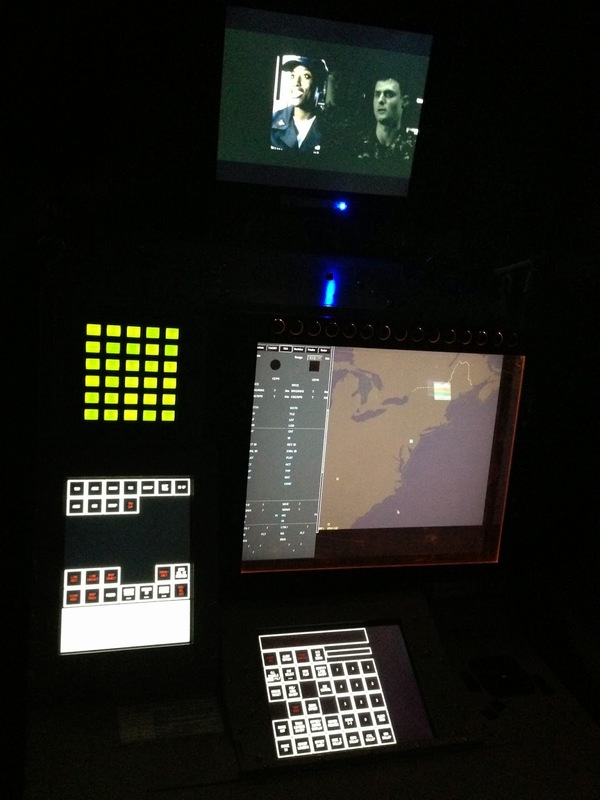 You can watch the commissioning live through this website. All photos are taken by Pennsporter and Chris W. Stein. While it's difficult to believe due to the frigid temps, we've actually moved on to the cusp of spring time and that means exercise. The fine folks over at the EOM (138 Moore Street) have you covered by offering a yoga session every Wednesday evening from 7pm to 8pm. The classes are taught by certified yoga instructor Larkin Silverman of BiggieSmallz Yoga, who describes the sessions as " flowing practice" intended for participants of all skill levels. Yoga can be quite expensive, but not here in Pennsport, as each class is offered for a suggested donation of $5 -- just make sure you bring your own mat, water, and towel. "In this cold winter, most of us hold our bodies tight and stiff. This class is about building some internal heat, getting your blood pumping, and finding an energetic sense of ease in the body. This class will help you drop expectations about what your body can and cannot do and help you cultivate some quiet relief in you like to peel away stress, fatigue, and anxiety." The weekly yoga sessions kicked off last Wednesday and have become a hit with the ladies in the neighborhood. "Right now we have about ten students," mentioned Larkin. "[They're] a fearless band of older South Philly women who walk every morning around 6am to exercise together and build community." She also mentioned they've brought their daughters along to help fill out the class. We like to harp on the community building element to help further the neighborhood and make it a better place. This is certainly an opportunity to stretch those muscles and meet some of your fellow Pennsporters -- yes, even you dudes out there as well. "We are really missing a male presence in the class," she mentioned. The EOM has long been a pillar within the neighborhood since 1961 by providing boys and girls of all ages a safe place to participate in organized activities ranging from sports to dance to after school programs. Larkin says that the yoga sessions wouldn't have gotten off the ground without the help of Ed McBride, EOM's President. "He has been super supportive and accommodating and worked with the civic association to create space for us on the EOM schedule. We have moved the class upstairs from the banquet hall (Ed. note: where the civic association meetings are held) for a bit more intimacy and a warmer space." Can't make the classes but still want to see yoga grow in Pennsport? 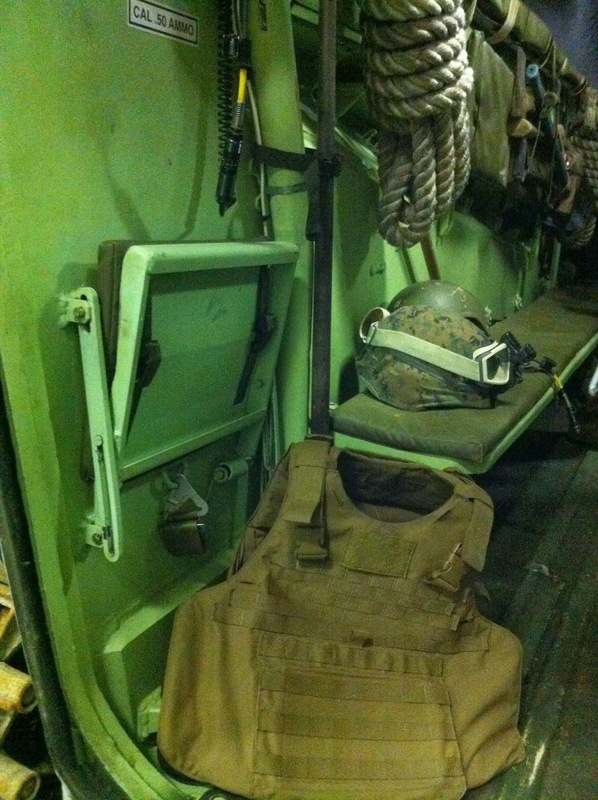 Please consider donating new equipment like mats, straps, and blocks to the EOM to help the center continue its growth. "Shop Local" is a phrase that has become popular in recent years. While it typically refers to locally grown produce or nearby small businesses or craftsmen, it can now be applied to the extremely popular video game market. Ghost Crab Games, a two-man independent game development studio from South Philly from the minds of Chris Hoopes and Dustin Twilley, is currently being featured on Steam's Groupees Build a Greenlight 5 for the studio's first release entitled "Drive To Hell." The coolest thing about Steam Greenlight is that it's a way for indy-developers to get noticed. "It helps us get a bit of funding as well as name recognition which is crucial in this business," said Chris. 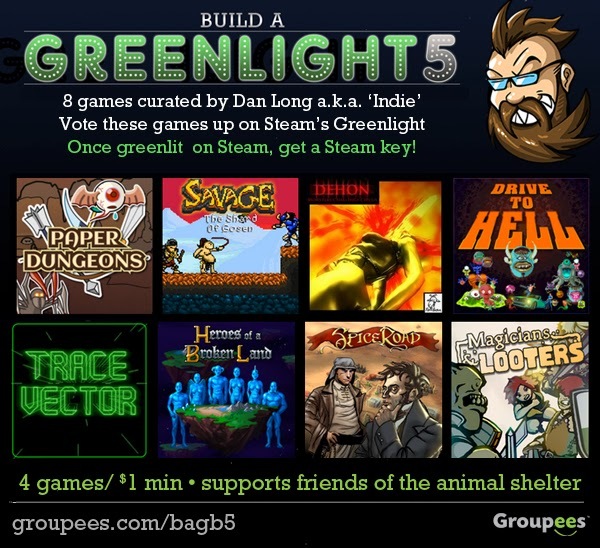 Through Greenlight, people can vote for the games they'd like to see "greenlit" to be sold on Steam, the largest digital game distribution platform. Vote here to support "Drive to Hell" and a couple of dudes headquartered around the corner at 6th and Dickinson. "Drive to Hell is an action-packed shooter where you’ll take a ride through an army of monsters to exact revenge on the Demon King for destroying your favorite dive bar. Enemies assault from all sides, each with it’s own special personality and attack style. To take them down, you’ll have access to many weapons and items as well as unique vehicles, special abilities and more!" It looks awesome, right? Well, it gets even better because you have the opportunity to purchase this game at a name-your-own-price type deal. Hit up this link and you'll have all of the info you need to avenge the loss of your favorite watering hole. But you better hurry, the deal only runs through Friday. You can still purchase the game after the "Greenlight" experience is over through Ghost Crab Games' store where is $7.99 -- a steal for a locally made and insanely fun video game. Oh, and hey, give Ghost Crab Games a follow on Twitter for updates on "Drive to Hell" and their other projects. A version of this post was featured on Passyunk Post, which you can view here. Rizzo Rink, the ice skating rink literally built beneath I-95 at Front Street and Washington Avenue in Pennsport, will be holding "Rally 4 Rizzo" tonight, February 21st from 730pm to 10pm. Tickets for the event are $15 in advance/$20 at the door and will feature a DJ, food and beverages, face paintings and raffle prizes. Proceeds will benefit the upkeep of the rink. A hammer signed by Flyers All-timer, Dave "The Hammer" Schultz. A regular hammer would have been incredible but this hammer has a picture of "The Hammer" in his prime. Isn't that mustache glorious? 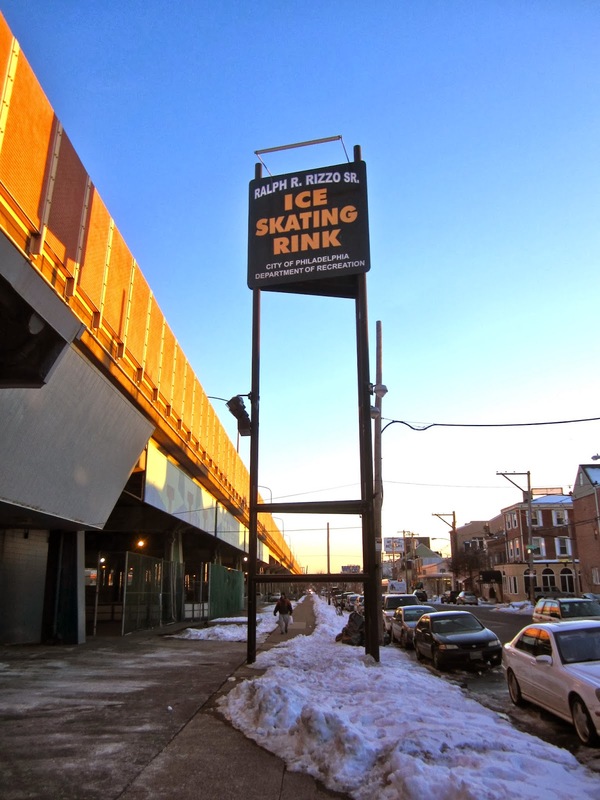 While the website bills Rizzo Rink as the "Best Kept Secret in Philadelphia, George Kilcullen, Supervisor at Rizzo Rink, hopes the event can showcase the rink as an amenity to the area and to show "Rizzo is still here." He also wanted to clarify the "Rally" aspect saying, "Rizzo isn't going anywhere...we want to conitnue to keep it as big and as strong as ever." Kilcullen pointed to the continued strength of the Youth Hockey Program at Rizzo Rink, which features three age groups: Mites (boy and girls ages 5-7), Juniors (ages 8-10), and Seniors (ages 11-14). The Mites program is seeing increased enrollment each year and reaffirms that the hockey program is stronger than ever. 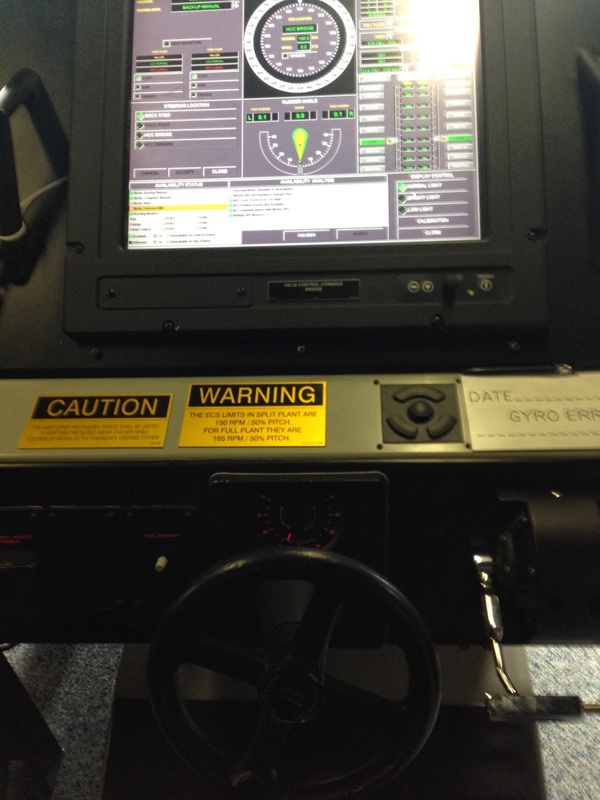 "We could take more as long as they register early," he said while noting they scraped together new and used equipment for those in the program in need of any gear. The public skating schedule features one session on Wednesday from 330pm to 5pm and two sessions Friday through Sunday between the hours of 3pm and 8pm. The "Rally 4 Rizzo" offers the opportunity to check out the rink and have some fun ice skating on a Friday night. "It's a night for the community to get together...everybody and anybody is invited," said Kilcullen. 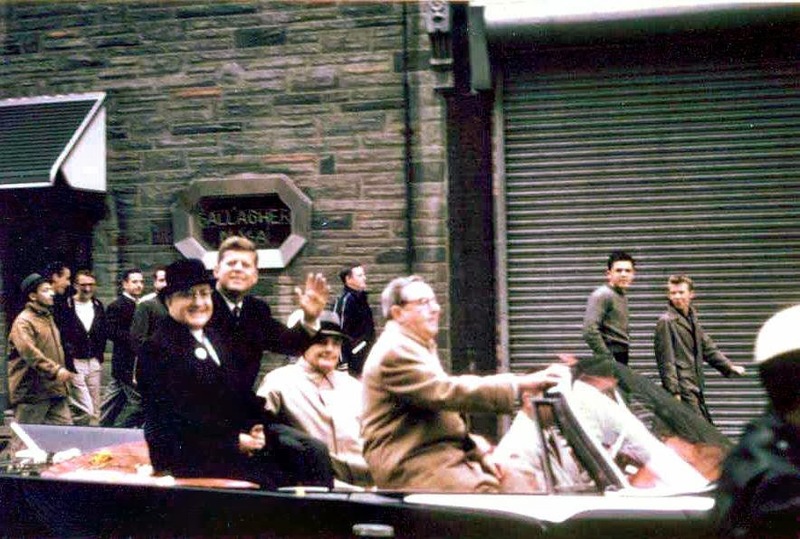 Take a look at this amazing shot of Senator (and soon-to-be President) John F. Kennedy campaigning via convertible through Pennsport in October 1960. I know it's technically Third Street, as he's in front of the present day Second Street Irish Society and looking at Furness High School -- stay with me non-Pennsporter's, but it's incredible to imagine that such an event would take place today: The American Icon, President John F. Kennedy, struttin' down Two Street. History folks will not only recognize President Kennedy but also Frank Rizzo, Former Mayors of Philadelphia Richardson Dilworth and James H. J. Tate, and U.S. Congressman Bill Green Sr. were on the scene that day in Pennsport. The pictures comes courtesy of the Facebook page Rowhouse Recollections -- a must follow for historical pictures, fun facts, and a great look back in to what South Philly (and especially Pennsport) used to be like "back in the day." Spot any of your friends or relatives in one of these pictures? Post by Row House Recollections. Yo, who's the place that loves you back? That's right, Philly. So, why not show your love by sharing your favorite things about Philly on your favorite social networks this Valentine's Day with #WhyILovePhilly? It's simple: tag any of your hashtag-able, Philly-loving posts on Twitter, Instagram, and yes, even Facebook (seriously, you can use hashtags in Facebook posts) with #WhyILovePhilly and you're doing your part to spread the love. Let's face it, you're going to be stuck at home tomorrow due to the Snownado and chances are very high that you'll be twiddling on your social networks all day. So why not get prepped for the Philly love-fest early and invite your friends to tag #WhyILovePhilly as well. Like, Share, and Retweet all of those tags post that really speak to why you love Philly so damn much that it reminds you about the time you got that unfortunately placed tattoo of Benjamin Franklin that you've never mentioned to your parents. Visit the website for more info and to look at #WhyILovePhilly tagged pictures to get some inspiration. While you're at it: give PhillyLoveNotes and Young Involved Philly a shout out throughout Valentine's Day to make your #WhyILovePhilly experience complete. You may have seen this picture floating around the internet in the past few days. Philly runs Kelly Drive, The Parkway, The Rivers, and Center City but what about Pennsport? 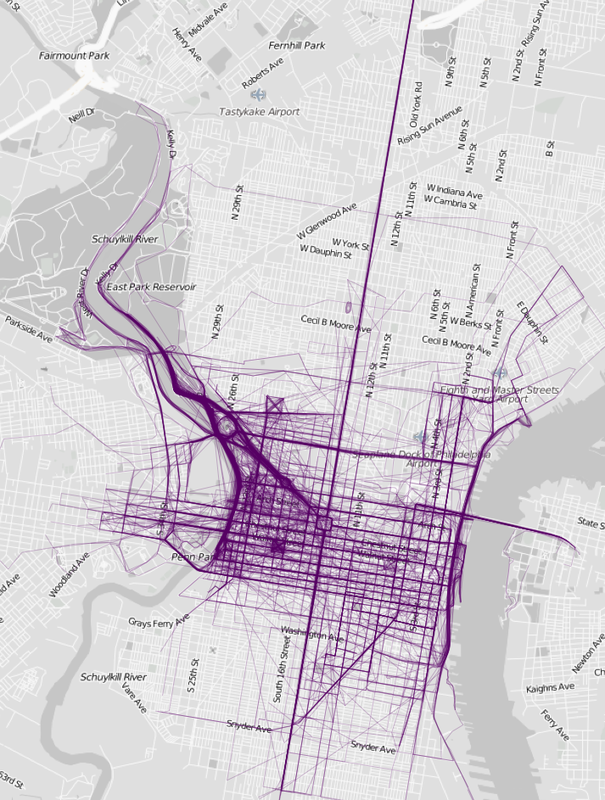 FlowingData put together this visual representation of where people like to run in Philadelphia. The information is taken from the fitness apps most of us (yes, I sometimes partake in a jog around the 'hood) use without thinking of how the data is analyzed, or in this case, visualized. A quick glance at the map and you'll see the typical running spots as heavy purple lines: Kelly Drive, Center City, The Schuylkill River Trail, and along the Delaware River. Absent from this picture is that these heavy lines along the Delaware River beyond Washington Avenue and down in to Pennsport, especially from Pier 53 through Pier 68. However, this soon might change in the near future. The continued development on the Pennsport section of the Delaware River Trail is an immense opportunity for the neighborhood and Philadelphia as a whole. 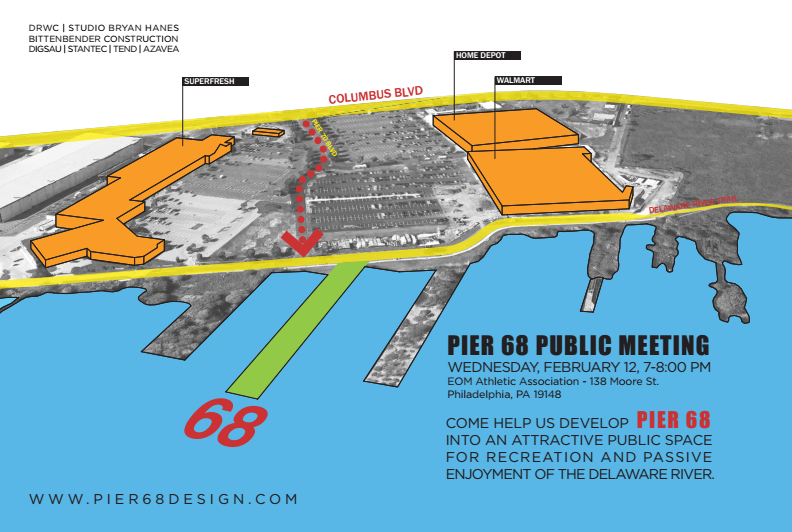 In fact, with construction ongoing at Pier 53, there is a meeting this Wednesday from 7pm to 8pm at the EOM to discuss just that -- future recreational opportunities along the Delaware River at Pier 68. While much of the talk is about the future fishing and kayaking opportunities, not many people are taking in to consideration the importance of Pier 68 as the final piece of the Delaware River Trail -- a fact that could benefit runners the most. 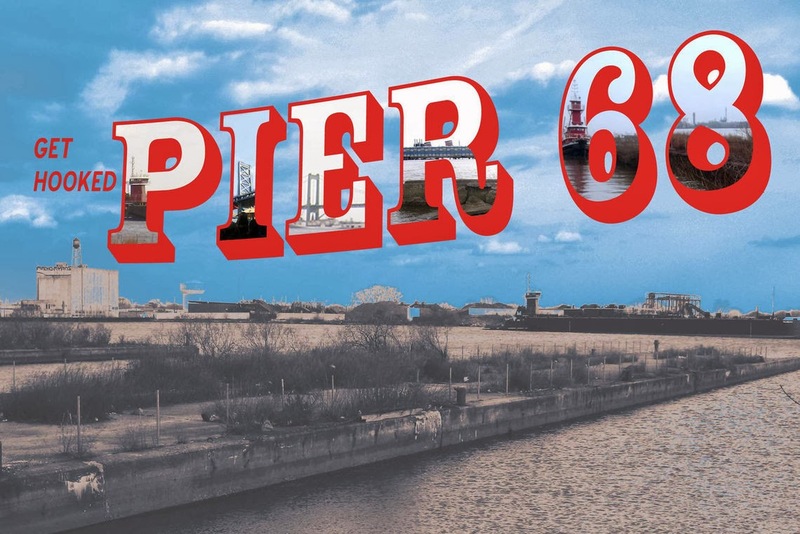 Come to the meeting on Wednesday night to get more information on the future Pier 68 site. Take part in a collaborative community process that is actively seeking your input to help shape this site in to something you will actually use. Can't make the meeting Wednesday night? Take this brief survey. I'll be bringing the free type answers to the presenters and submitting the ideas for consideration. The Delaware River Waterfront Corporation, in conjunction with Studio Bryan Hanes, Bittenbender Construction, DIGSAU, Stantec, TEND Landscape, and Azavea, has announced a collection of public information sessions regarding the development on Pier 68 - the future fishing and recreation pier set to open later this year located near Walmart on Columbus Boulevard. The first of these sessions will take place during the monthly Pennsport Civic Meeting on February 12th from 7pm to 8pm at the EOM and your input is vital to the development of the site. As you are probably know by now, we've been loudly bangin' the old drum about the development on the Delaware River, especially the Pennsport section, and hope to see a large turnout for these upcoming meetings. Interested in the Pennsport section of the Delaware River Trail? You're going to want to hit up this meeting. "Today's announcement reaffirmed and expanded upon the notes from the meeting in April. As you can see in this article from Plan Philly, the structure of Pier 68 has been deemed viable out to 390 feet, that's up from 350 feet at the April meeting. On top of that, plans have surfaced for the use of Pier 68 -- a public fishing pier with potential for recreational watercraft. That shouldn't come as a huge surprise as it was revealed in the April meeting that Pier 68 was currently, albeit illegally, being used in that capacity (as well as a tugboat landing) and that the DRWC was looking to design a project around the wetlands." This news, coupled with the timeline of Pier 53 scheduled for completion in the Summer/Fall 2014, and you're looking at a total sea-change for the Pennsport waterfront in around a years time." If you have two seconds, fill out this quick survey about the development along the Pennsport section of the Delaware River. For those of you who plan on attending the meeting, the survey could also help you to develop some talking points for your neighbors or those in attendance. A version of this report appears on The Passyunk Post, which you can find here. A second community meeting regarding the development of the old Mount Sinai Hospital at 4th and Reed Sts. 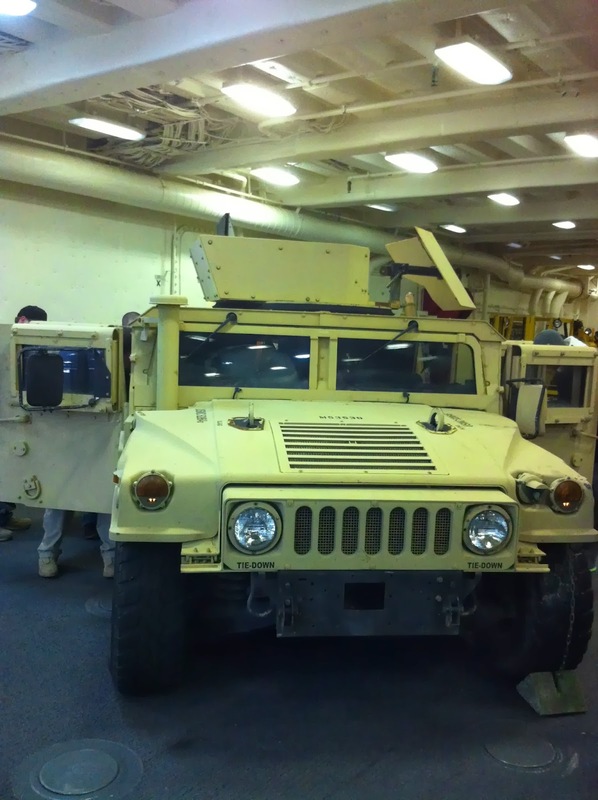 was held last Monday night in Pennsport. 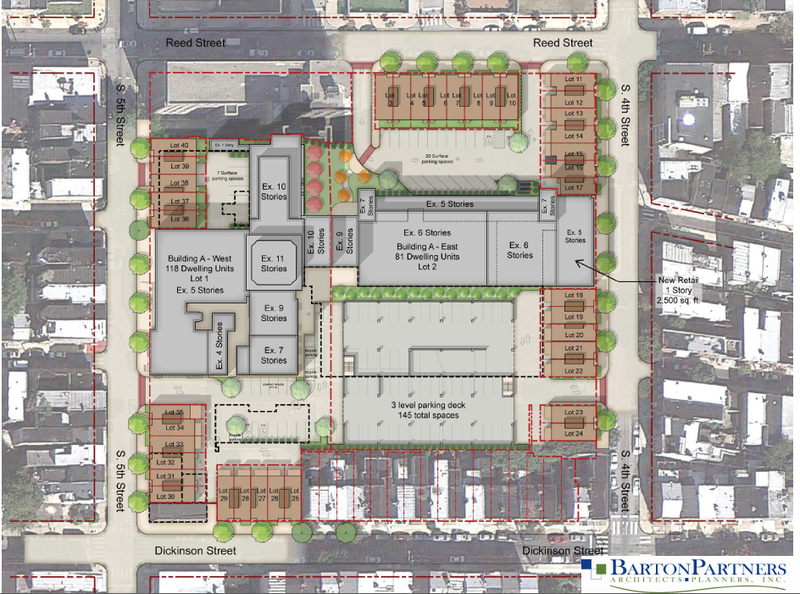 Developer Gagan Lakhmna, Attorney Richard DeMarco, and Architect/Project Manager Jeff DiRomaldo of Barton Partners were on hand to reveal much different plans from the first meeting back in December. 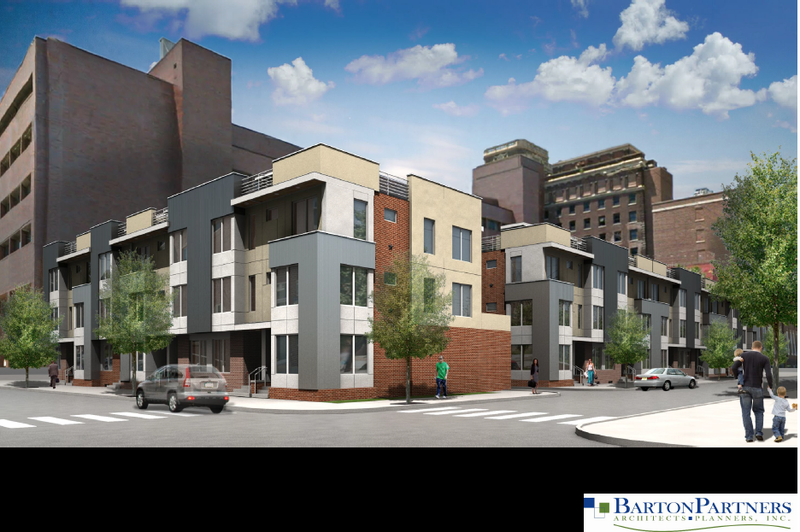 Town home component would shift from 44 foot, four-story homes to 36 foot, three-story homes. 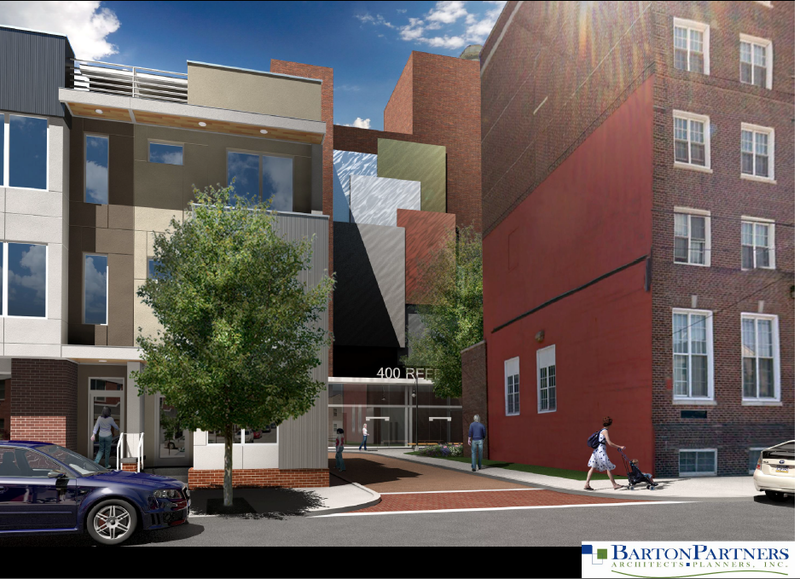 A 22 feet high, two-story parking garage replaces the proposed interior surface lot. This bumps parking from 137 spaces up to 210 -- nearly a 1:1 parking ratio. 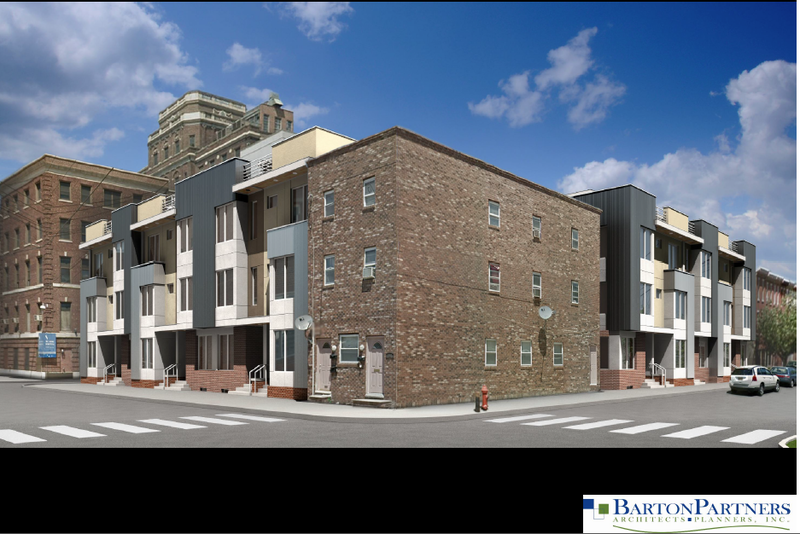 The garage will be shorter than the town homes and not be visible from the street. Town homes at 5th and Reed Sts. would no longer have front loading garages. A single driveway leading to a seven space "auto court" behind the town homes. The 2,500 sq. ft. retail component on 4th Street is still in the plan. It will be marketed as a retail "opportunity." Lakhmna will hold another community meeting once there is a better idea about what type of business can occupy the space. No, Jose Garces was not mentioned at this meeting. If all goes according to plan, Lakhmna explained he still expects the original 36 month timeline for the completion of the project and that he could break ground on the first town homes this April or May, provided he obtains the necessary variances, permits, and financing. Lakhmna envisions a potential daily construction schedule of around 7am to 4pm on weekdays with an occasional Saturday. A "community liason" will be appointed to address any issues between the site and nearby neighbors during the constructions phase. The proposal for Mount Sinai goes before the Zoning Board on February 12, 2014 at 2pm at 1515 Arch Street, 18th Floor, Room 18002. In all, it seems as though the new proposal took neighbors' concerns in to heavy consideration and came back with a different vision that pleased most of those in attendance. The height of the town homes was a major sticking point in previous meetings and the new, three-story plans would seem to fit with the houses in the area. Neighbors seemed a little wary of the design but Jeff DiRomaldo insisted they would stick with these designs going forward. The new height of 36 feet is also under the maximum height in the zoning code, meaning a height variance will no longer be required. Financing of the project seemed to be an issue with those in attendance. Lakhmna explained that he has the financing in place for the town home component and that it would be secured once the zoning is finalized. Personally, I was amazed at the amount of parking in the new plan. A near 1:1 parking ratio was a clear sign that they were paying close attention during the first round of neighborhood meetings and people seemed pleased. Lakhmna mentioned that the potential for non-tenants to lease parking spaces could be an option as long of it was in line with the property management and space was available. However, he also explained that he would be designing the on-site amenities with the tenants in mind, so keep an eye on that in the future.